Polymath8: Bounded Gaps between Primes – Xiao-Feng Xie, Ph.D. 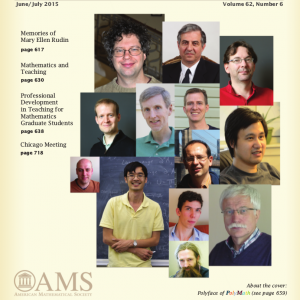 The Polymath8 project, led by the Fields Medalist Dr. Terence Tao and in collaboration with a team of top mathematicians, was launched to optimize the records of the bounded gaps between primes based on the breakthrough work of “Bounded gaps between primes” by Dr. Yitang Zhang. He proved that there are infinitely many pairs of primes with a finite gap, and thus resolved a weak form of the twin prime conjecture. In number theory, an admissible k-tuple is a set of k distinct integers that do not include the complete modulo set of residue classes (i.e. the values 0 through p – 1) of any prime p ≤ k.
Zhang showed that in some k0 values, for every admissible k0-tuple, there are infinitely many positive integers n to shift the k0-tuple such that each shifted k0-tuple contains at least two primes, and thus the width H of the admissible k0-tuple establishes the upper bound for the gap between primes. Zhang initally showed any k0 ≥ 3,500,000 (which leads to H ≤ 70,000,000) is adequate for the bounding purpose. A polymath8 project was then started to find smaller k0 values and smaller H(k0) values for them. Here is the code K0Finder (Java, bash, and maple are required), and a k0 Table, for optimal k0 of MPZ(i)(ϖ, δ) in different settings of cϖ, cδ, i. Here is the code KTupleFinder (Java) for minimizing the width value H of an admissible k-tuple for a given k.
– Polymath8 project for finding bounded intervals with primes. – New bounds on gaps between primes by Andrew V. Sutherland. – A new database has been set for collecting narrow admissible k-Tuples. – The theoretical progress can be found in the blog of Terence Tao.